The origins of cotton candy are unclear and the inventor of this confection can’t be pinpointed. However, four individuals have been identified and named as the inventors of the candy and they are William Morrison, Thomas Patton, Josef Delarose Lascaux and John C. Wharton. William Morrison and John Wharton were two candy makers from Tennessee. They invented the first electric cotton candy machine and were awarded the patent for the cotton candy machine in the year 1899. This machine made cotton candy by melting sugar and utilizing centrifugal force to spin the sugar and force them through tiny holes prior to releasing them. When they received the patent, the group brought and introduced the machine into the 1904 St. Louis World Fair. On the other hand, Thomas Patton was experimenting with caramelized sugar and used a fork to form them into ribbons. Then he designed a machine that used a gas-fired rotating plate that would spin the sugar and form them into ribbons. These threads were subsequently collected and formed into a big cotton ball that’s now referred to as cotton candy. He presented the machine in the Ringling Brothers’ Circus where it was a hit and sold like popcorn to children. He received a different patent for his machine and his process for making cotton candy in 1900. Around the same time, Josef Delarose Lascaux, was a dentist in the state of Louisiana who introduced cotton candy in his dental practice. He, however, didn’t get a patent or trademark for his cotton candy unlike the other three. The early patented machines were found to be faulty and didn’t last long. The Gold Medal Products company came up with a more reliable cotton candy machine that used a spring base. This new machine contributed to the transformation of the cotton candy market. Cotton candy is a massive hit because it is extremely simple to make. The process of making it is different from the standard way candy is made. In cotton candy, sugar is melted until it is in a liquid state. The liquid sugar is then spun in the cotton candy machine. These holes form the sugar into ribbons and cool the liquid sugar. Once the threads of sugar are cooled, they become strong again. Afterwards, the center of the machine is full of thousands of small threads of sugar which are subsequently collected by a stick. The threads adhere to the rod and the ball grows bigger as the threads adhere to more threads. It’s then shaped into a ball and served. Sometimes, the ball is stuffed into a plastic bag with the stick removed. Some stalls offer other flavored cotton candy and others may even provide you toppings like milk powder to go with it. 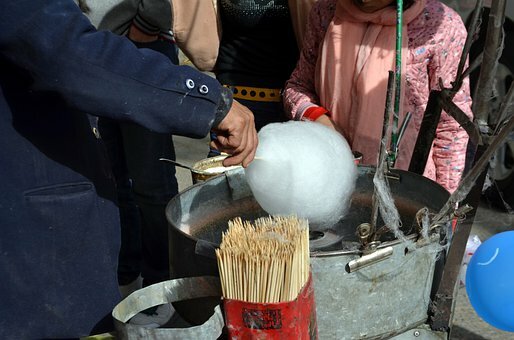 Nowadays, cotton candy machines and stalls are found everywhere. You may see them in amusement parks, fairs, playgrounds and circuses. Even though its history has left a lot to be debated about, it does not really matter to the customers. To them, it is still a summertime favorite because it’s light, fluffy and sweet. just the way they like it.